Professional Studio Recordings - Real Instruments - Average Loop is only 20k big!!! This package is an instant download. It takes less than 10 minutes even on a slow dial-up connection to download these sounds. If you prefer the loops in WAV Format, Click Here! Professional Studio Recordings - Real Instruments - Avg. Loop is only 20k big!!! This package is an instant download. It takes less than 10 minutes even on a slow dial-up connection to download the package. 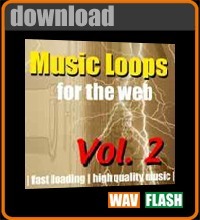 If you prefer the loops in WAV Format, Click Here! Receive a FREE Flash Music Player to use on your Site...Click here to learn MORE!